This is what I did today. 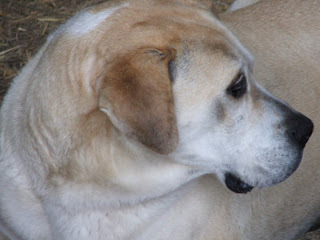 After scaring a hundred geese out of our wheat fields which they have mowed down like a lawn. Well, not my lawn as the lawnmower is broken I have not repaired it yet. The powershift/hydrashift/amplitorque or whatever you call the on the go shifter on a White tractor failed on our 2-135. 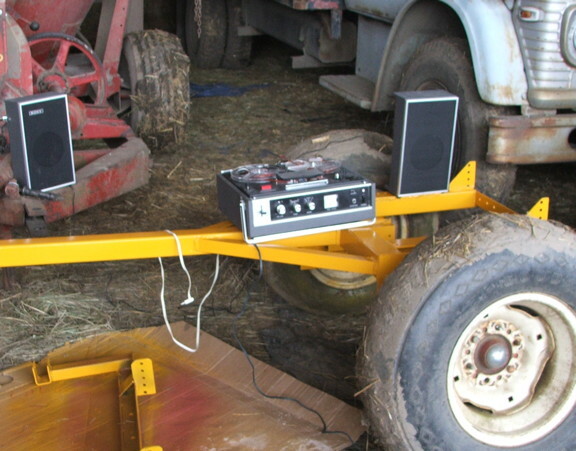 It failed in a mud hole while spreading fertilizer and the tractor came to a complete stop. However, after the transmission cooled down it would move in over and direct. In underdrive it does not move. The oil is black and smells like fried clutch disks. 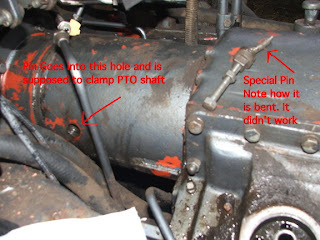 You have to remove the engine to get to the over/under which is a separate unit from the main transmission. To remove the engine you remove the standard stuff, sheet metal, wires, fuel lines, and you remove the radiator and that big brushed aluminum mystery metal grill thing in the front. The oil cooler and a/c condenser fold forward. You have to remove the a/c pump but not the hoses. It hangs off the side. We sat it on the hay bale we were using to stand on. To remove the fuel tank you block it up, remove the hoses, take the air intake off the air cleaner, unbolt and rotate the metal elbow straight up out of the way. Then you unbolt the supporting straps and unhook the fuel sending unit. Then you remove the front tank support, pull the blocks from under the tank and tilt the front of the tank down as far as you can. That way you can tilt the back of the tank up to get it past the cab and lift the tank up tilting it to clear the air cleaner housing. It is a bit tricky which why I'm writing it down. I forget from time to time. 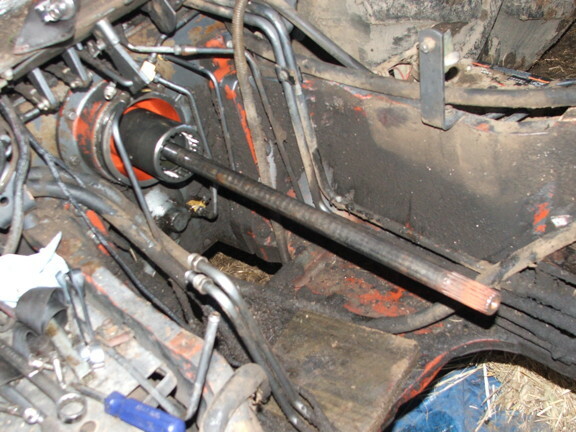 The next tricky step is removing the engine and over/under without getting the short PTO shaft jammed up. It will either stick in the flywheel hub or the hub on the transmission side. If you know were it is going to stick you can either remove the engine and over/under as one unit or you separate the two at the clutch bell housing and pull the engine by itself. The book shows how to make a clever little set screw plug thing that inserts into a hole in the over/under and clamps the PTO shaft. It doesn't work so after you make it you might as well just chuck it as far as you can throw it. 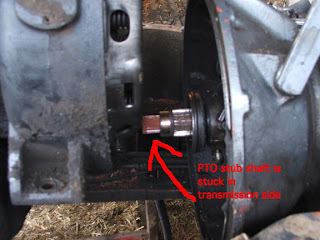 You then have to figure out if the PTO shaft is stuck in the clutch hub or in the transmission. This a very critical step as if you do it wrong things get very jammed up. I'm not really sure how to tell you to figure it out. I turned the fan and it seemed like too many things were turning. There is a coupler between the over/under and the transmission. I think you can slide it back far enough to get your fingers in to feel the PTO shaft but I couldn't. We took the weight off the engine and over/under as one unit but it just didn't want to slide far enough ahead. So I slid it back and we unbolted the bell housing. 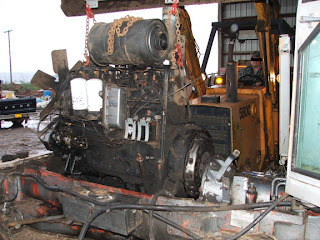 The engine sprang free and we lifted it out. Here is a photo of the offending PTO shaft. I was having a hard time getting the shaft loose from the transmission hub but I found that by turning the tractor wheels and backing up just a touch the over/under just slid off the shaft. Don't do this if you are not rebuilding the over/under as it can ruin the seals in the middle of the hollow shaft in the over/under which result in many puddles of oil and much frustration. What you should do is block up the over/under and make sure it is not in any kind of a bind and then you should be able to pull the shaft out by hand. Pictured below is Stanley, the dog who nearly made the music die. Not even dogs like "Leaving on a Jet Plane," set to strings. I think it was an act of desperation. 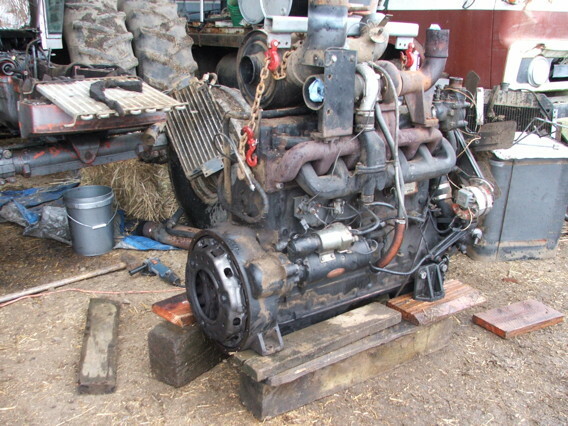 How many old White tractors have you taken apart now? Did you ever think , when you were in college, that you would soon have a career disassembling heavy equipment? A bigger job than I would feel confidant in attempting. Not too many renaissance men left. Man that looks like work. Anything more complex than a Cockshutt 40 is getting beyond what I want to get into now. I need to replace the leaking intake gasket on my Blazer vortec engine but think I am going to have it done by someone who knows what they are doing and get paid for all the headaches. Ralph, Pulling the engine is not as bad a job as it sounds. Rebuilding the three-speed is much more difficult but my brother is an incredible mechanic.I don't think I have ever taken something apart and put it back together with out finding extra parts when I am finished. I listen to Hank Jr. I looked at my Amazon Associates Account today! 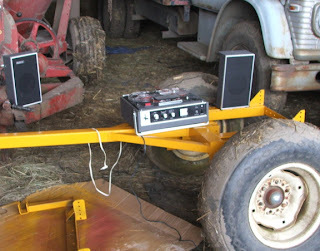 Ralph Posts Song of the Lazy Farmer! You have to read this story! I wonder if this guy needs chicken feed?